Keith Gehres serves as Registrar for Purdue University West Lafayette. He began in this role in September 2018. Keith provides leadership for a variety of responsibilities within the Office of the Registrar, including: records, registration and graduation; academic and classroom scheduling; academic services; residency and FERPA; academic operational support; and credit evaluation. 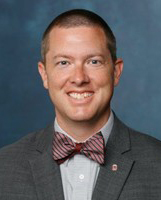 Prior to joining Purdue, he served as director of outreach and recruitment for Undergraduate Admissions at The Ohio State University and in various other positions within this office for fifteen years. During his time in Undergraduate Admissions, Keith directed and supported recruitment and yield initiatives focusing on new first year and transfer students, for both domestic and international students. He earned a BA in Integrated Social Studies and a MA in Public Administration, both from Ohio State.